One challenging part was that Patos was so into her big sister, that it didn’t seem like I had the same connection with her that I did with Sucia as a puppy. Patos would rarely make eye contact with us but instead would go dashing off to find Sucia. We just hung in there and hoped that eventually, the loving, owner-connected weim might appear. Magically, it did! Just in the past few months, around the time she turned one, we have noticed that Patos is spending chunks of the day leaving Sucia alone, and will purposely seek us out for attention and cuddling and makes communicating eye contact all the time. Every evening is a cuddling session with one of us on the dog-approved couch. Not sure what brought about the change, but it is wonderful. Now our home has two loving, silly, fun, intelligent Weimaraners! It has been a joy to take them to my island cabin and let them run free on the property. At the cabin, sticks/small logs are the Thing of the Day. They have a ball exhausting themselves, running free in the fields and woods around the cabin. And then they come and collapse on the warm deck for the best naps ever. 🙂 Most days there also included a trip to the lakes for swimming while retrieving tennis balls. What could be better? Thanks again to both you and Cliff for being such amazing stewards of this breed! We are so happy to have the lengthy report about the two Stackhouse-sired sisters. Both Cindee and Livee have retired. We kept Dahlia and Bee out of Livee and Stackhouse. So far, we have never had a litter from either of these girls. It was not for lack of trying. Deja Vu (Ginger X Blue) has produced four puppies. Ginger is a littermate to Cindee. The co-dependent behavior you experienced it not all that strange. You did the right thing. Just hang in there, and eventually, the newest addition will come around and bond. It wasn’t so much about anything other than the almost twin-like connection. You are fantastic Weim parents. Patos is Thriving; I am exhausted! Wanted to let you know that tiny Patos is thriving. She may be small, but she is mighty! She is rambunctious and fearless. I think it will take constant vigilance and consistency to get her through the lovable, but exhausting early puppy stage, but I’m sure she will be worth it. Big sister Sucia copped the attitude of total Weimaraner disdain when Patos first showed up here. The looks that Sucia could throw at her, or the haughty lift of the head and purposeful turning away from the puppy were almost comical. We just let it be and now, a little over a week later, Sucia seeks out Patos for kisses and play and last night for the first time, Patos crawled over for a nap next to Sucia on the big dog bed. Sucia actually gave a little happy contented Weimaraner groan as Patos snuggled into her. Yay!!! Patos went to the vet for her 9wk visit last Saturday. My regular beloved vet is temporarily out with knee surgery, so I went to a new vet for a one-time visit to get the shots done. Per your education, I made sure she only got the dAPPV as you recommended and nothing else. Patos weighed a mighty 7lb 5oz! 🙂 Her stool check was negative for worms. We are happy that Sucia has turned the corner and realized that Patos is not only staying, but it is an excellent thing to have a sister. I am glad you are sticking to the vaccine protocol. It has proven time and again to produce high vaccine titer results–in turn, keeping the additional vaccine at bay with the risk of a severe vaccine reaction. We do encourage folks to worm their puppy on a regular basis. There are certain things we cannot speak to for a broad-based audience. Each person must decide what the real risk is when it comes to Heartworm–is it vital to start the new puppy on this medication. Well, maybe. If so, should you use the Plus version that covers the worming as well as guarding against the dreaded heartworm scenario? The one caution we do have is to not overload your Weimaraner’s system with a lot of chemicals. 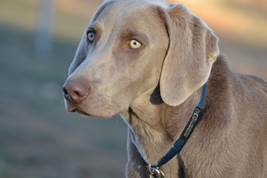 Be as Holistic as possible–this is even more important with the young Weimaraner; however, some adult Weims can react to various medications. Proceed with caution and do a bit of research–if there are reports from dog owners who have used a product and it caused seizures, we recommend choosing another option–different pain medication, etc. Weigh the risks and just because one person didn’t have an issue, keep in mind a percentage of Weims do have severe (even life-threatening) vaccine reactions–as well as a low tolerance for certain medications. One that comes to mind is the Rimadyl. The Weims may help with some of what you can–or that which doesn’t make the jar is more likely. We are happy to see that Tobryn is accepting his new Blue brother (Tallyn). You are doing well with them Ron. Thanks for the share. I hope the year has treated you all well. I thought I would send a few photos of Sgt. Blue Gunderson Walker (we got him from you in May of 2013–Cindee’s litter). He has shown to be a very strong hunting dog and wonderful family addition. He had amazing point control. Below are a few pictures of my oldest two children and Blue. The first picture is a picture of Blue and Olive (my cousin’s dog–short/wire hair pointer mix) during the fall of 2014. We wish you well from CA and a happy new year! Breeder’s Note: Thank you, for remembering us and allowing this to share with the OwyheeStar readers. We truly appreciate it, and we are exceedingly happy to see Sgt. Blue is meeting your expectations. I’ve been meaning to write you with an update for a little while but keep getting side tracked. I know you understand with the puppy and all. (Haha) Ghost has been absolutely wonderful! He is so great at the barn, he waits patiently without me while I ride, no whining or big scene, and he’s cautious about the horses but not just running stupid scared. He’s been just so great. I can’t wait until we can start taking him to parks and the dog beach. He’s growing up so fast it’s just unbelievable. Every week he’s like a different dog! We are continuing independence training and as soon as he can he’ll start going to doggy day care once a week to have some play time out of the house and without me. I’m so happy fate shined the way it did, he’s just absolutely perfect; so handsome and so with it. You can see him last weekend at grandmas house running around –so fast in one of the photos above. Did I say they grow up fast? Breeder’s Note: The Weimaraner needs on-going socialization. Yes, it is important to avoid public locations. Nevertheless, you folks are doing it right. You have found ways to help the pup learn to be adaptable, and confident in an ever-changing environment. The concrete-thinking Weimaraner can easily get so set in their ways, that anything different is freaky-scary. That doesn’t mean there are no ‘feat-periods’ when a dog might freak over the seemingly nothing. These are the times when you go on about your business without giving this incident much attention. While we are on the topic, the absolute Repeated Wordworst thing you can do during one of those situations is to console them—them– “ poor-baby “ is the Repeated Wordworst possible response. You do not want to ingrain the fear; you want to work past it, and not give it license. These folks are doing all the right things…They are..1. avoiding the risk of contracting Parvo. 2. continuing with a broad-based socialization program suited to his or her lifestyle. 3. Teaching the pup how to cope with their beloved human’s absence. Keep up the great work, and thanks for sharing your experience with us, and those who read the OwyheeStar Weimaraner News Blog. Hello Cliff and Shela–I hope everything is going well for you both. We are really enjoying Blue, as he has made a lovely fit in our family. He can’t get enough of the water and loves to go camping with us. He adores my youngest, Ella, who is three. He is so very sweet with her and seems to know just how to gently play with her. Breeder’s Note: Thank you for sharing this update. We truly appreciate it. We will look forward to hearing about Blue’s success in the NAVHDA N/A Spring Hunt Test. It is good to hear that he is a great family Weim too!